If you’re one of those obsessive geeks that fusses about the dings and scratches one can inflict on precious gadgets then this might be the thing for you – the Ozaki iCoat. Two reasons 1) it protects your iPhone and 2) for the brand whore in you, it doesn’t crimp the “face value” of having an iPhone. From the makers of the hippest iPod accessories comes another nifty innovation. 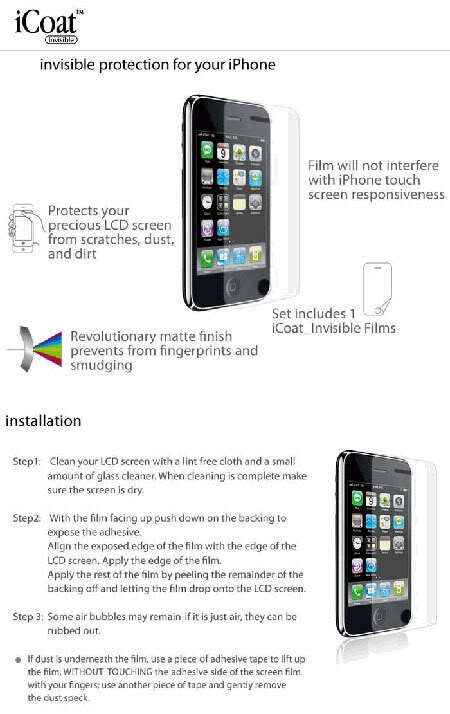 Ozaki iCoat Invisible Skin shields your iPhone’s delicate LCD screen so it doesn’t have to suffer the damages brought by dirt, dust and scratches. Can you let your beloved iPhone go unprotected? Click here to see more of iCoat. Ozaki is exclusively distributed in the Philippines by MSI-ECS. For more product information and other inquiries, emailmarketing@msi-ecs.com.ph, visit www.msi-ecs.com.ph, or call 688-3180/688-3181.